UK police seizure poses question: 3D printed gun components, or printer parts? 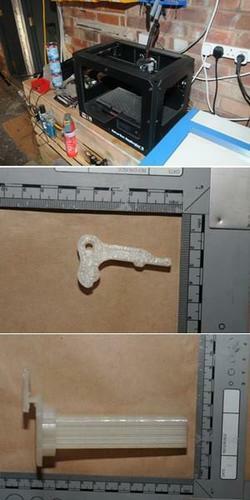 The seized 3D printer and what the Greater Manchester Police identified as "the clip and the trigger" of a 3D printed gun. The Greater Manchester Police have seized components for what they say could be the U.K.'s first-ever confiscated 3D printed gun, though others point out that the parts look like bits that a hobbyist would print out to modify a printer. The police showed the confiscated 3D printer and "the clip and the trigger" of the supposedly 3D printed gun on its website and on its Facebook page on Friday. But shortly after the message was posted, commenters pointed out that the supposed clip and trigger looked like parts to upgrade the MakerBot Replicator 2 3D printer. Comparing the seized parts with components on Thingiverse, MakerBot's design community website, it appears that the police could have actually seized a filament and spool as well as a part of a spring-loaded Replicator 2 drive block. The Greater Manchester Police updated its Facebook page a few hours after its original announcement with a second statement concerning the issue. "We need to be absolutely clear that at that this stage, we cannot categorically say we have recovered the component parts for a 3D gun," read the statement attributed to Chief Constable Steve Heywood. "What we have seized are items that need further forensic testing by national ballistics experts to establish whether they can be used in the construction of a genuine, viable firearm. We will also be conducting a thorough analysis of computers we have recovered to establish any evidence of a blueprint on how to construct such a weapon," Heywood said. Printed firearms do exist. The first operational 3D-printed gun was fired at an undisclosed private shooting range outside of Austin, Texas in May. This was followed by the firing of a 3D-printed rifle in August. "The worrying thing is for me is that these printers can be used to make certain components of guns, while others can be legitimately ordered over the Internet without arousing suspicion. When put together, this could allow a person to construct a firearm in their own home," Heywood said. The Manchester police's announcement they had discovered components that could be part of such a gun has opened up a wider debate about the emerging threat these next generation of weapons might pose, he added.